Davidson alumnus Paul Schulz '82 has purchased and donated back to the college Ten Days, a literary and visual art collaboration between two Davidson professors in 2010 and 2011. Schulz made the donation of poetry and drawings to honor his former professor and long-time faculty friend, former Vice President for Academic Affairs Clark Ross. Ten Days was created by Herb Jackson, Douglas C. Houchens Professor Emeritus of Fine Arts, and Alan Michael Parker, Douglas C. Houchens Professor of English and Director of Creative Writing. 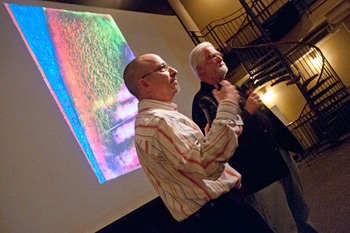 The two men selected 10 random days during a 15 month span on which Jackson created a painting and Parker created a poem. They worked completely independently, with neither seeing the other's work. The only rule was scale—Parker's poems were to fit on an 8.5-by-11 inch piece of paper, and Jackson's drawings would fit a 7-by-10 inch sheet. When Jackson and Parker finally revealed their works to each other, they realized that the pieces were connected in almost mysterious ways. For example, on day 10, Jackson's work involved the use of horizontal lines, and Parker's poem concerned climbing into a childhood tree house. When Schulz was a student at Davidson, he majored in economics—taking the first course Ross ever taught at Davidson in the fall of 1979—but he also took every art course possible to further develop his creative gift. He and Jackson formed a unique bond, and though their styles were different, they helped each other grow. "It is extraordinary that an opportunity existed for me to make one gift that so closely touches Herb and Clark," said Schulz. "I took just about every class Clark offered during my time as a student, not unlike a lot of my classmates. He has a way of making a lot of not fun courses fun. 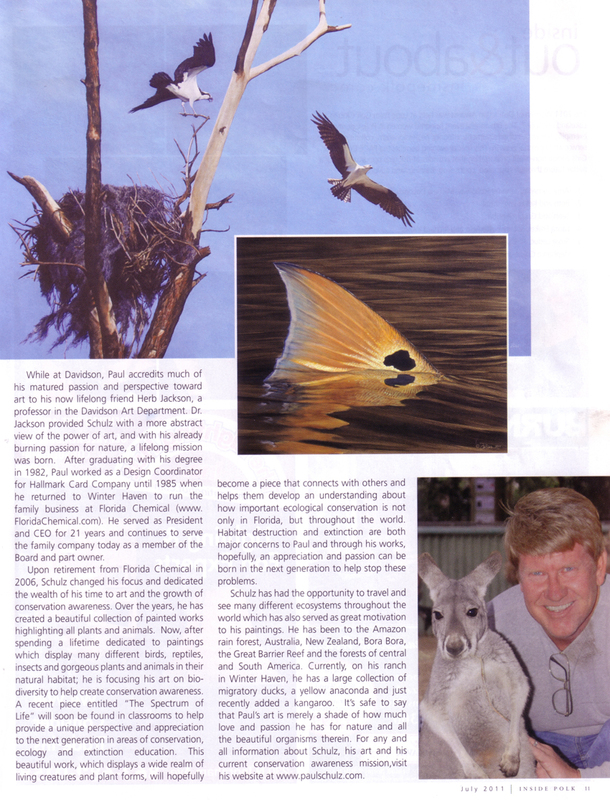 Herb and I see the visual art world similarly, even though he is an abstract artist, and I am a representational artist who focuses on nature and wildlife. Herb challenged me." The artists are overjoyed to see this special project live on through Schulz' generosity. "I am thrilled that Ten Days will reside at Davidson, as the project represents for me a model of collaborative verve and trans-disciplinary ambition," said Parker. "How right, too, that the work should be donated in the name of Dean Ross, who has been the project's greatest champion. This was an invigorating, eye-opening project for me, artistically. Honored to work with Herb Jackson, and trusting his brilliance, I nevertheless had no sense of how to define success within the agreed-upon parameters. My feeling is that the results succeeded well beyond my assumptions, which amazes me." "I think this project is an extremely visible example of collaboration between disciplines," said Jackson. 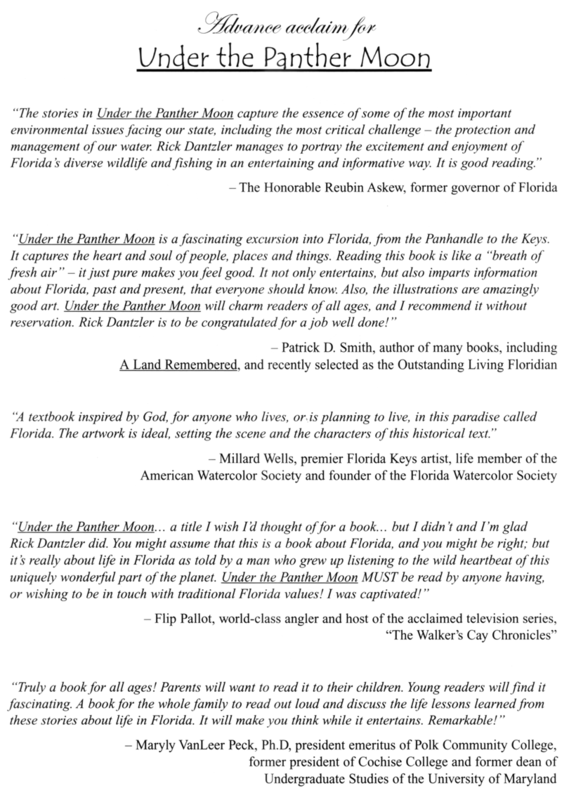 "It has received tremendous response every time we presented it. I am so pleased that Paul's generosity makes it possible for future students and the greater community to encounter it for years to come." Clark Ross is honored to be recognized in this way by Schulz, and because Ross will return to the Davidson faculty following a one-year sabbatical, he will be able to enjoy the collection well into the future. "The exercise and creativity itself represents liberal arts and Davidson," said Ross. "I was excited by the original presentation of Ten Days, and it is gratifying for me to see it continue in this extraordinary way. It is very meaningful to be associated with these three people." Schulz' first job out of college, a greeting card design manager with Hallmark Cards, combined both art and business skills. He pursued the position in part through his friendship with Davidson classmate, David Hall '84, whose family owns the Kansas City-based company. Schulz then moved on to his family's business, Florida Chemical, which he managed for 21 years. He always wanted to make a significant impact for Davidson, and when his company was acquired by publicly traded company Flotek, he had the resources to consider the opportunities available to him. Ten Days is a project that represents everything Schulz loved about his time as a student as well as passions he continues to pursue through his art work. "The morning the business announcement was made, I immediately called Clark," said Schulz, who serves on the college's Board of Visitors, "because I knew I could finally make this gift. Since graduating in 1982, I have seen Davidson's fingerprints in all meaningful endeavors in my life, and I'm pleased to give back in this way." Paul Schulz knows how to take care of business. Now hes ready for his colorful paintings to take wing. Colorful art by Paul Schulz has been on display at the Winter Haven Library. He began his career as a design coordinator for Hallmark. 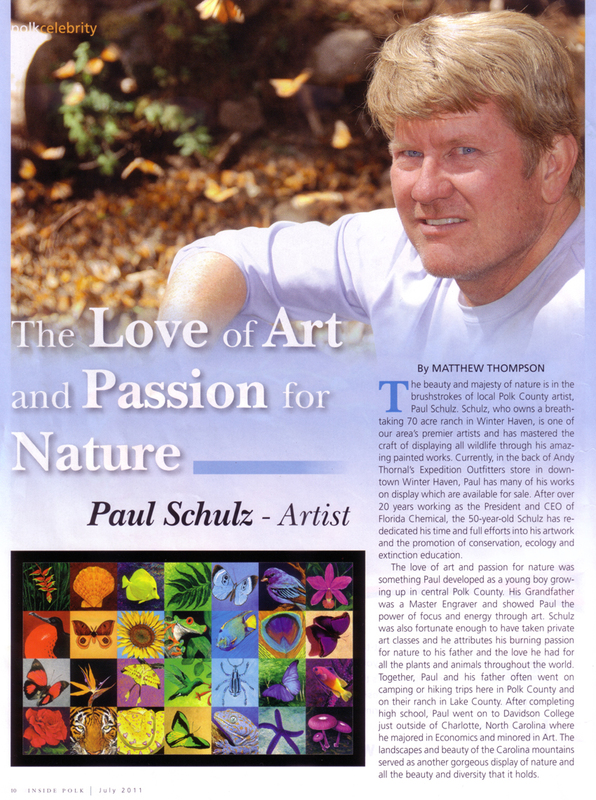 Paul Schulz uses real butterflies as inspiration. I embellish the color to get the essence of what Im trying to convey, he says. A butterfly sculpture adorns the garden area at Paul Schulzs Winter Haven home. 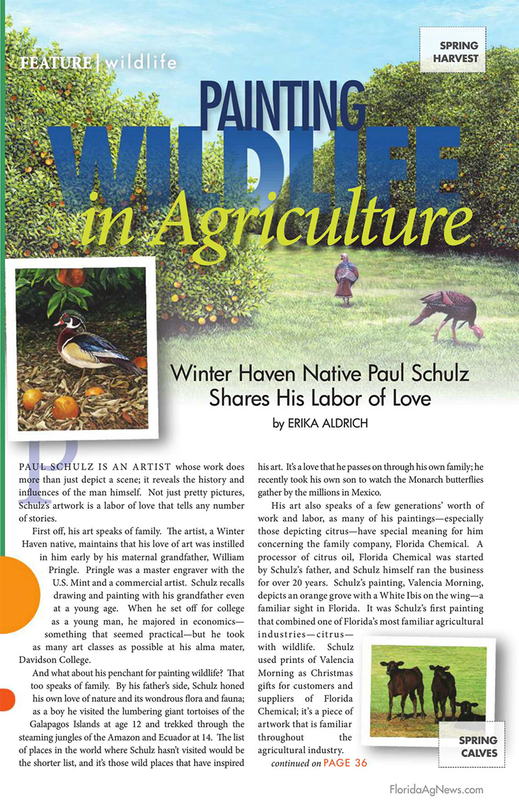 WINTER HAVEN -- Paul Schulz's interest in all forms of life is reflected in his many creations, from wildlife paintings to the diverse ecosystems on his 30-acre estate, named Swallowtail Hollow. Schulz, 42, said his interests are a fusion of his father's love of natural sciences and his mother's attraction to the arts. 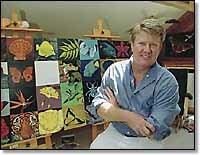 Schulz majored in economics and minored in art when he graduated from Davidson College in North Carolina in 1982. 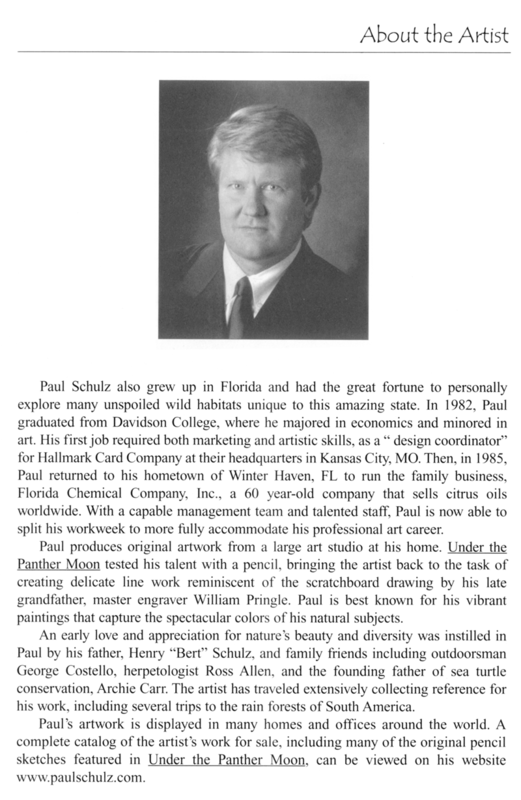 He began his career working as a design coordinator for Hallmark Cards Inc. for 21/2 years until 1985, when he returned home to Winter Haven to run the family business, Florida Chemical Co.
After he took over, the company experienced rapid growth with increased popularity of orange household cleaners and laundry detergents. Now, with a firm corporate support system in place, he is finding more time to pursue his other interest -- art. "I've enjoyed Florida Chemical and the business adventure getting me into my early 40s," Schulz said. "Now I can grow my art career into something." 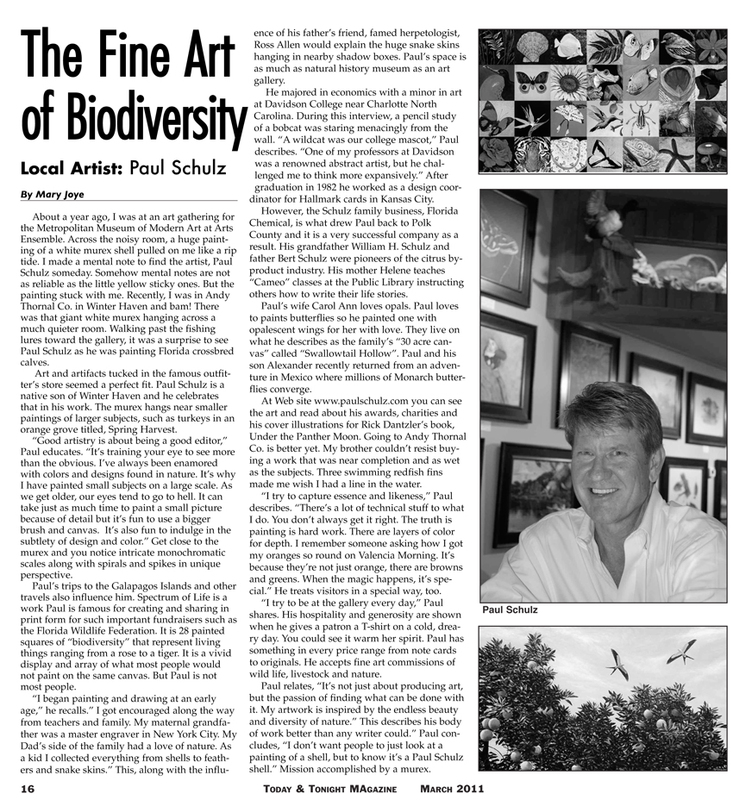 One of Schulz's recent works, "Spectrum of Life," a tribute to biodiversity, is showing up in Winter Haven and beyond. 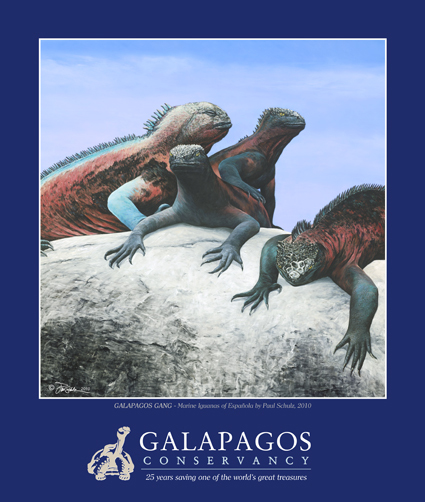 The painting is the 2004 Florida Wildlife Art Exposition poster. It features 28 panels in rows of four and bands of seven colors. Each panel features an animal or plant from around the world in vibrant colors. 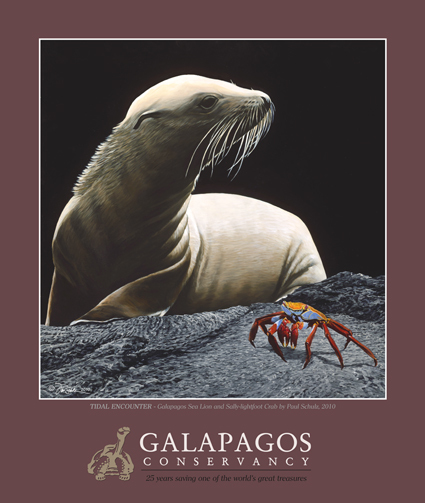 Some of the flora and fauna portrayed come from Schulz's travels to many different environments, from the South American rain forests to the Galapagos Islands. "I like color and am drawn to subjects that inherently strike a chord with people," Schulz said. "I embellish the color to get the essence of what I'm trying to convey and run with it, to bring out the most from that subject." The new Winter Haven Library is displaying the painting in its children's room -- both in its entirety and as enlarged single panels. "The colors add so much to the children's department. They're so bright and vibrant," said Debbie Couture, children's librarian. "We get lots of compliments on the paintings, from both the kids and the adults." Reproductions of some of Schulz's work may be purchased at the Friends of the Library store in the Winter Haven Library lobby. A new painting, "Grove Patrol," portrays a fox that used to wander the area around Schulz's home but was killed when it tried to cross the road. Schulz had the animal mounted and used it as his model. "Grove Patrol" has been chosen for the poster of the Citrus Expo 2004. "It's very important to me and something I have a specific acuity for," Schulz said of his painting. "I derive a lot of satisfaction from it." Linda Florea can be reached at lflorea@orlandosentinel.com or 863-422-8017. 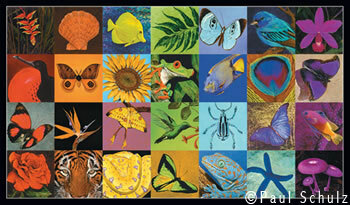 Looking at Winter Haven artist Paul Schulz's "Spectrum of Life" - the 2004 Florida Wildlife Art Exposition's event poster piece - the vibrant colors captured on the canvas suggest a life-long passion with color itself. Schulz seems quite comfortable with his use of color. The idea itself brings a smile to his face as the 43-year-old fondly remembers a conversation he had with his much- beloved art professor at Davidson College, acclaimed abstract artist Herb Jackson. "I was working with oils at the time and when you work with oils, if you're not careful mixing them -you end up with mud, " said Schulz who was being particularly careful one day. "Herb Jackson's work is very colorful and one critique he had written of my work read, 'Paul, are you afraid of color?'" "From that time on, I hear that phrase resonate in my head - it really made an impact on me," said Schulz, who sometimes finds himself busy working in his home studio "throwing an extra dab of paint and saying aloud, 'take that Herb Jackson!'" These days, Paul Schulz isn't afraid of color or much else. 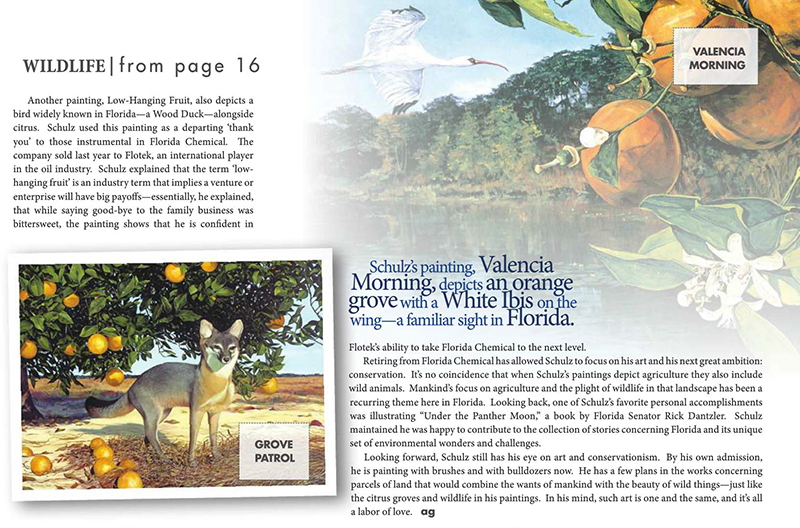 The president of the successful family citrus oil company - Florida Chemical Company - in the citrus industry since 1942, Schulz continues to expand his family's business while enjoying the freedom of exploring his passion for art. "I'm now in a really positive position with my 'day job' as our company continues to grow with an extremely capable and awesome team," said Schulz, who is assisted by Josh Snively, vice president. The company's offices and hallways have become "a Paul Schulz art gallery of sorts" - showcasing Schulz's view of nature I a variety of forms. 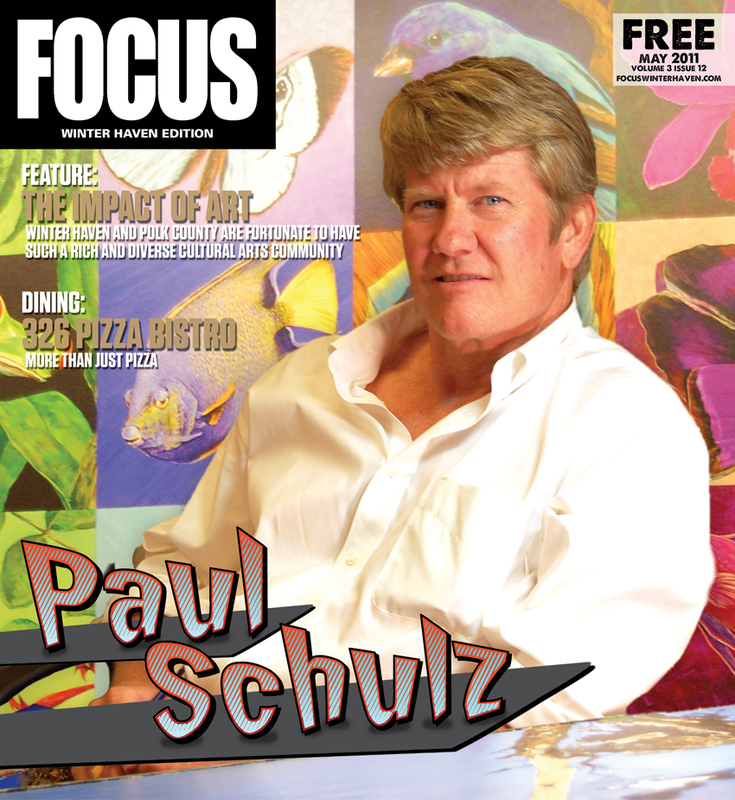 "With the best artists, you can see they have taken something unique in nature and made it their own," said Schulz, whose own crystal-blue eyes twinkle with childhood delight when he discusses his passion for art. "When I paint, I take something from nature that I observe and personalize it while keeping the integrity of what I've captured. I tend to accentuate the color - embellish it to make it my own." That's the case with the 2004 expo poster - "Spectrum of Life," a piece Schulz has spent two years creating in his home's studio. 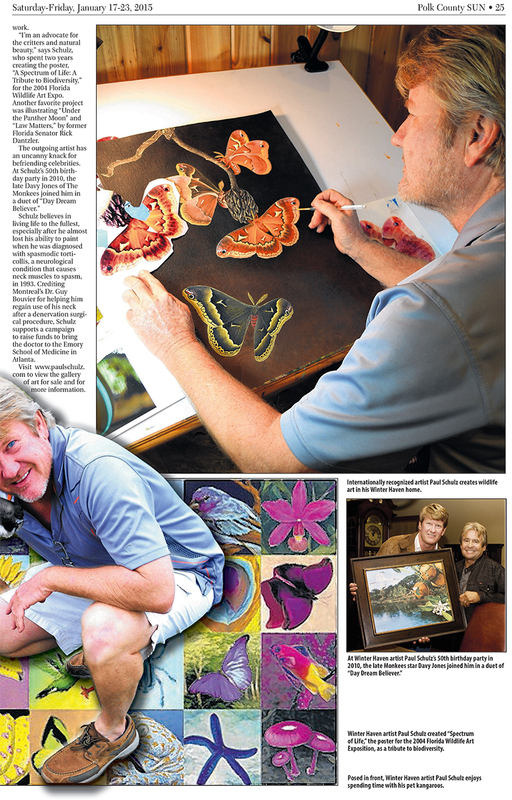 "The subject matter - a tribute to biodiversity -- is something that has wide appeal," said Schulz who is pleased that a Giclee reproduction of the original will be included at the McGuire Center for Lepidoptera Research at the I University of Florida which will house the world's second I largest butterfly collection when it opens this spring. In each of the color panels featured in the artwork is a butterfly. 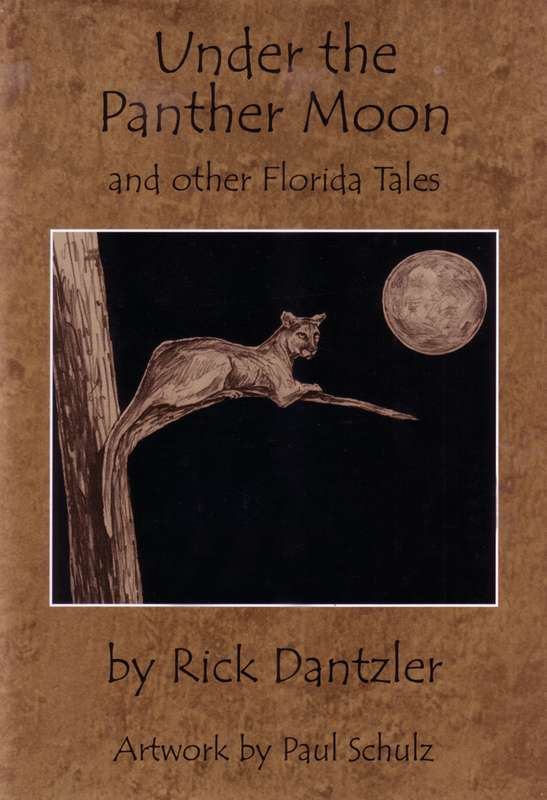 Schulz first became involved with the Florida Wildlife Art Expo last year after collaborating with former Florida Senator Rick Dantzler of Winter Haven as the illustrator for Dantzler's book, "Under the Panther Moon. " "I thoroughly enjoy the expo," said Schulz. "It's really a homecoming of sorts - a reunion -- for artists. That's part of the appeal. 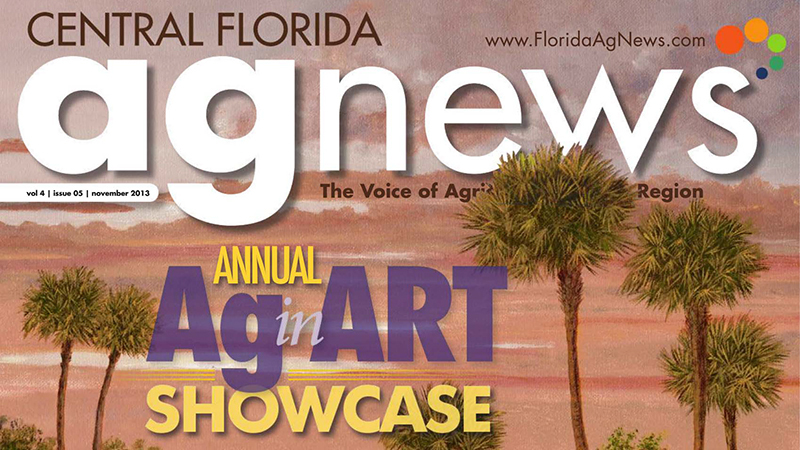 Each art genre has its means of plugging in to the event." "Rick's book was a big hit at last year's expo, " said Schulz. Some of the last pages of the book feature Schulz's graphite sketches - fishing lures, in fact - that are similar to the engravings his grandfather, the late William Pringle, did for the U.S. Mint. "My grandfather actually apprenticed for seven years with a master engraver from France," said Schulz, who was pleased to receive from his mother, Helene Schulz (who is actively involved in the local chapter of the National Alliance for the Mentally Ill), a special Christmas gift --"the engraver's Bible, a publication that was printed in the late 1800s and given to my grandfather in 1910." The book joins Schulz's extensive collection of artifacts - many prominently displayed in shadow boxes - that he has collected over the years. "In my next life, I'm going to be a museum curator," said Schulz with a laugh, referring to a section of the home he shares with his wife Carole Ann and their son, Alexander that he calls "the Smithsonian room." While many artists don't enjoy commercial success - despite their talents - Schulz is grateful for the success of his family's business so there isn't the pressure to produce art for financial gain. In fact, it was his loyalty to his family that brought Schulz back to Winter Haven in 1985 to assist in the family business. He had been working as a design coordinator for Hallmark Card Company -a firm with, at that time, 600 + employees in its creative department (the most anywhere and the answer to a Jeopardy question, according to Schulz). While the company was growing, Schulz's art was taking a back seat. AI originally thought I'd come home and help out Dad (H.E. "Bert" Schulz) at the office and paint on the side," said Schulz. "We were just too busy for that, I soon discovered." To complicate the situation, in 1993 Schulz was diagnosed with a neurological condition known as spasmodic torticollis - which causes neck muscles to spasm - contracting muscles and pulling the head to the side. It adversely affected Schulz's ability to work as well as to paint. Throughout it all, his family provided encouragement and support that resulted in discovering a "denervation procedure" performed by Dr. Guy Bouvier in Montreal, Canada that helped Schulz regain use of his neck - "clearly improving the quality of my life." Schulz is now actively supporting projects to generate the $2 million needed to establish a neurosurgery chair at Emory University's Medical Center in Atlanta. A special bonus for Schulz during his visits to Emory has been the opportunity to meet former heavyweight boxing champion Muhammad Ali, -' who was presented with a signed reproduction of Schulz's "Emory Eagle" and Jane Fonda, who was in town for the opening of the Fonda Center and who also received a signed copy of Schulz's creation. 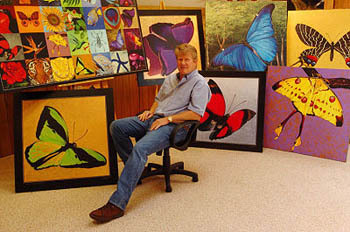 Paul Schulz in his studio at Swallowtail Hollow with his ongoing work "Spectrum of Life" a tribute to biodiversity. WINTER HAVEN -- He attributes his success to Team Schulz. 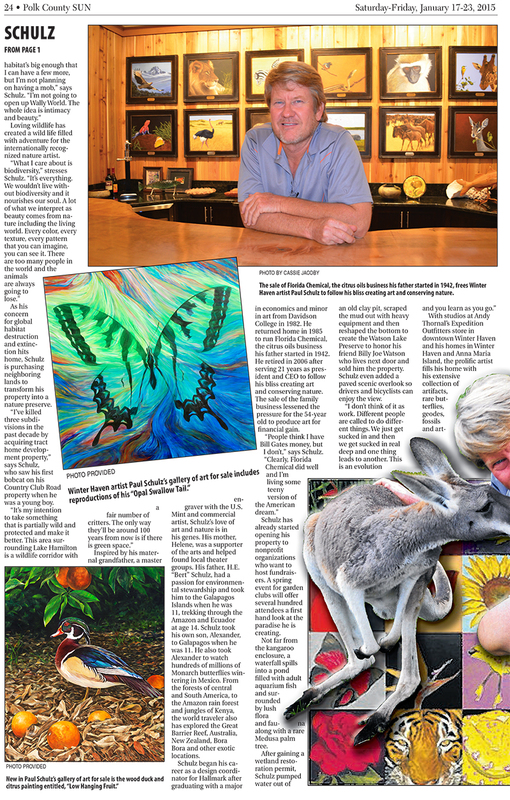 For local artist Paul Schulz, the head of citrus oil producer Florida Chemical, support from family and a competent staff make life ideal. "I'm living the American dream," Schulz said. "Of course, getting here was an adventure. But I'm grateful every day, because you can't do it alone. You need good people around you. That's the best thing I have going for me, is the extended Schulz team." The most important member of Schulz's team is his wife of 11 years, Carole Ann. "You can see all that's going on around me," Schulz said. "I couldn't have so much without her. She's so bright, so capable, and she has very practical, commercially viable skills." 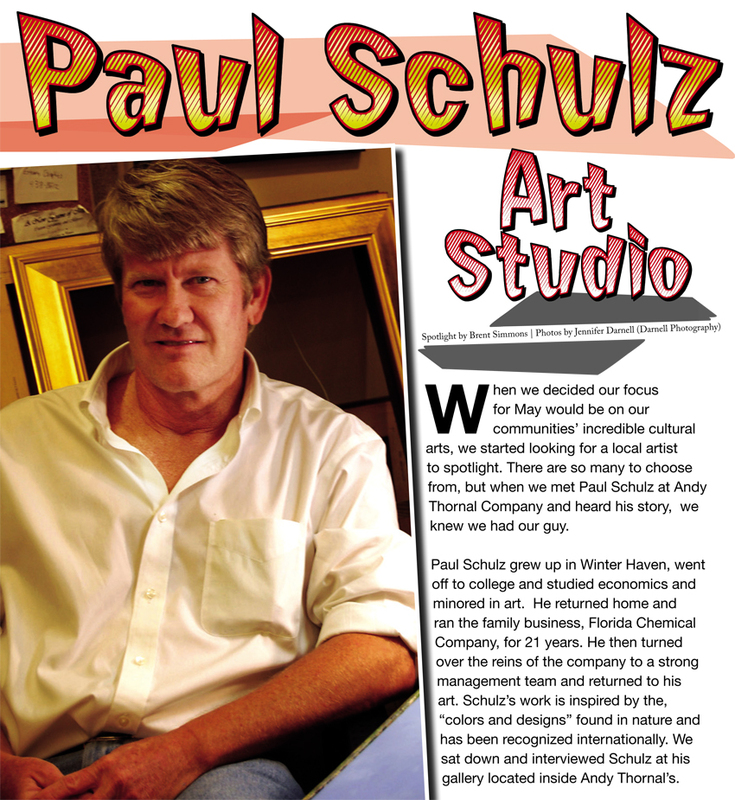 The Schulzes work together on both art and business projects. 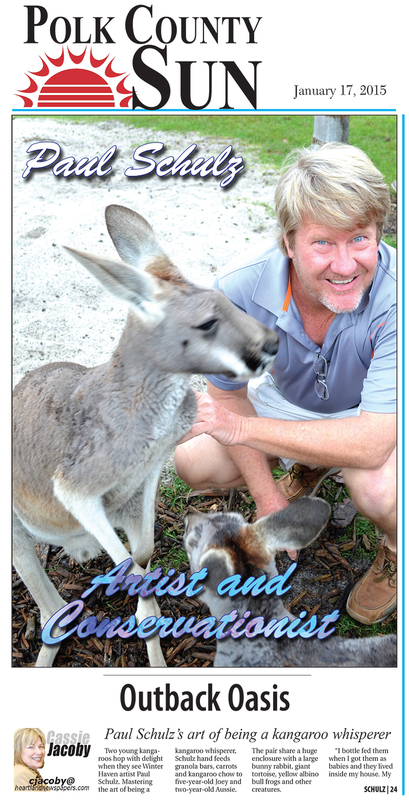 Carole Ann provides technological support for Florida Chemical, as well as for his art. Currently, she is touching up family heirlooms. "My grandfather was a master engraver. If something isn't done to archive his work, it will be lost," Schulz said. "Carole Ann is re-scanning and digitally doing touch-ups on the digital images. She's doing a remarkable job and it's such a wonderful project for our family." Other family projects include 5-year-old Alexander, who has his own easel set up in his father's studio. "He's my buddy," Schulz said. "Of course, we've had our moments over the years, when he's wanted to sneak up behind me and paint on Daddy's painting with Daddy." Schulz just entered the Federal Duckstamp Competition, a prestigious national project. 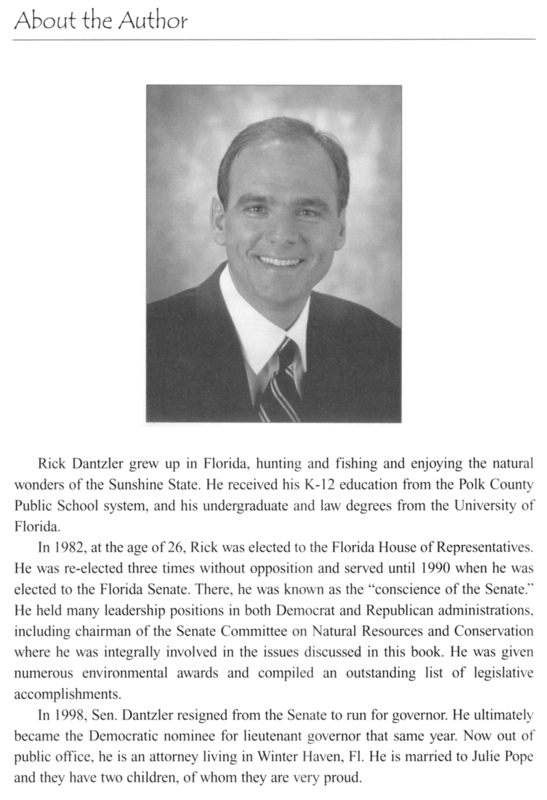 He is currently completing a book with Winter Haven resident and former gubernatorial candidate Rick Dantzler. His current painting, "A Spectrum of Life: A Tribute to Biodiversity," will be marketed as prints and featured in libraries, museums, and a new science center at the University of Florida. But morning sketches on 3M notepads are some of his most important pieces of art. "It goes in Xander's lunch box," Schulz said. "Today's assignment was a giant squid with a horse. That's what he asked for, and I had five minutes to come up with something. So I sketched a horse on a beach waving at a giant squid in the water." The sea theme is echoed in Alexander's room, where fish swim and crustaceans frolic across a blue wall mural. The room is filled with science posters teaching Alexander the facts behind the objects of art. The facts are echoed throughout the house, with shadow boxes of rare butterflies, collection books, cases of shells, and more. "In my next life, I think I'll be a museum curator," said Schulz. "I love to collect things, and this is my Smithsonian room." The arts and sciences fill his Smithsonian room, his studio, and Alexander's bedroom, bringing a sense of unity to very different aspects of one man's life. "To the extent that art stuff is genetic, I got it from my mother's side of the family. I got my love of biology from my father's side. And now, artwork even has its place at Florida Chemical. The citrus industry knows me, knows my work, and we give out a lot of things. Our building is full of Schulz artwork," Schulz said. Schulz has built the life he wanted to create. "Florida Chemical is a family business, and our company is over 60 years old. In the mid-80s, my dad was at a point to retire, and the citrus industry was picking up. We negotiated that I would build an art studio on my office. I naively thought that I could run the company and still be a freelance artist. It kind of worked, and for a while, I'd be oil painting and talking on the phone at the same time. But then the business boomed and my art took a back shelf for a while," Schulz said. Life has a way of working out, if you're patient enough to let it. "I love it, now. A lot of good things have fallen into place, and a lot of it has to do with a very capable staff," Schulz said. "So Florida Chemical is fun now, and I do it on my terms. The neat thing, for my art, is that I can more or less do what I want. It's not my subsistence. I knew phenomenal artists at Hallmark who were at wits' end. They wanted to do great things, but they had to paint teddy bears." Schulz worked for the Hallmark greeting card company straight out of college, after going to school with the grandson of Hallmark's founder. He loved the people and loved the job, but knew he would move on to other things. "Businesses, life, everything -- they are fluid, dynamic things," Schulz said. "Everything today is so competitive, and if you're not changing, you get stepped on." Schulz has built success on change. 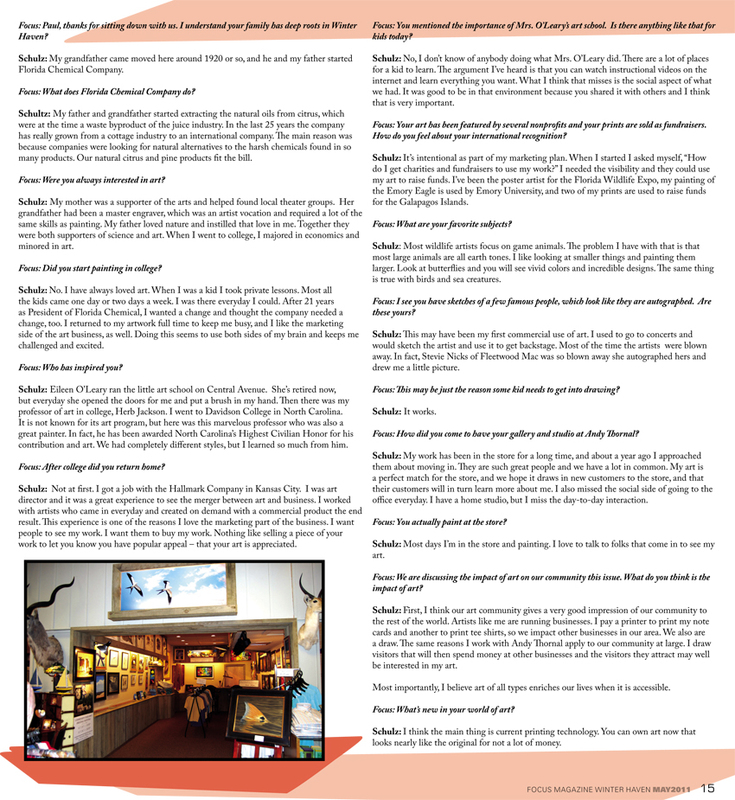 "I've kind of made the family business evolve toward me, and somehow it worked out," he said. From his family's point of view, everything works out well because Schulz works hard to make it work and earns his success. "He's so creative," said Carole Ann. "He gets it from his grandfather, who I feel like is in the room whenever I work on the engravings. Paul has so many projects going that his friends tease us for having so many balls in the air. It's great to get to be part of his creative process. He's the sweetest thing in the world." 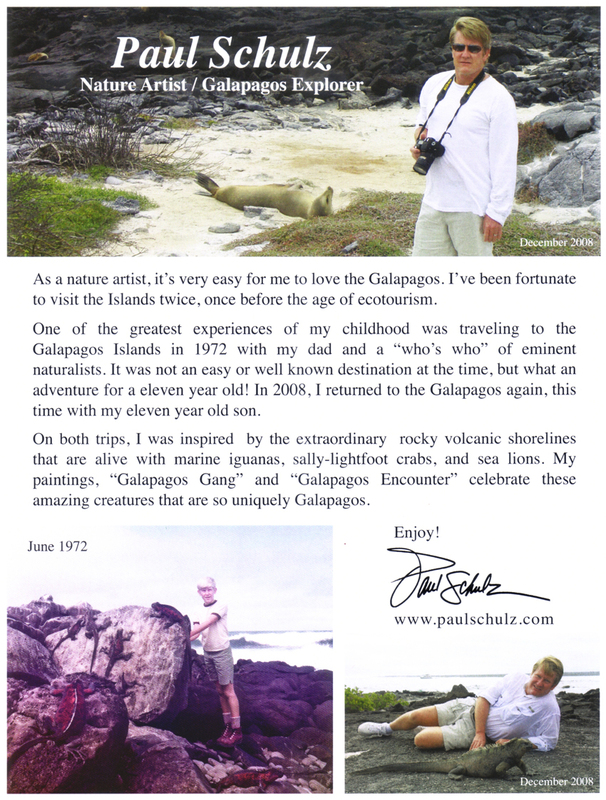 Artist Paul Schulz, is supporting the Bouvier Initiative with his art. 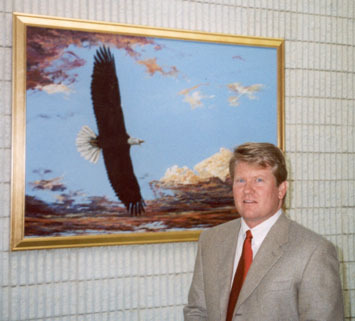 Those who make a gift of $1000 or more will receive an orginal signed print of "The Emory Eagle." A surgical procedure known as denervation has given Paul Schulz back his life, he says, and he is working to share that gift with others who have the neurological condition know as spasmodic torticollis. The procedure involves severing carefully targeted nerves. 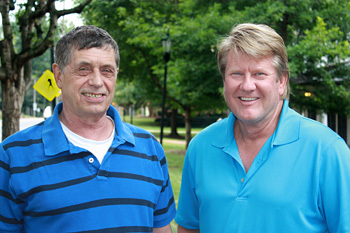 Schulz, an artist and businessman, made the first gift to the School of Medicine's Bouvier Initiative, an effort to raise $200,000 to bring Guy Bouvier, the specialist in spasmodic torticollis who performed Schulz' s denervation procedure, to Emory to teach it to others. The long-range plan is to secure $2 million to establish an endowed chair in neurosurgery for this area. Spasmodic torticollis is a movement disorder that causes some of the neck muscles to contract, creating irregular head movements. Usually, those affected are unable to work and function normally without treatment. "Bringing Bouvier to Emory to train our physicians in this procedure is a natural progression in our movement disorders program," says Dan Barrow, chair of Neurosurgery. "This will add an additional star in our repertoire of treatment options." Art has always been part of Schulz's life. Working in acrylics, oils, and opaque watercolors, he paints the sandhill cranes, swamps, snowy egrets, and other fauna and flora of his native Florida. He is president of Florida Chemical Company, a 50-year-old family business that sells citrus oil. But he still found time throughout the years to produce some limited-edition prints and have several private showings of his work. The spasmodic torticollis surfaced in 1993. Strong spasms in Schulz's neck muscles began to force his head to the right. Painting was very difficult-to be able to do so at all, he had to hold his head straight with one hand while painting with the other. "I had lived my life assuming I would always be able to paint," he says. He tried medication and injections but gained back only about 40% of his normal posture and movement. Searching for other treatment, he learned about denervation, referred to as 'the option of last resort." Denervation is not appropriate for everyone, and the procedure must be carefully customized. Schulz traveled to Quebec to have his condition evaluated, and after waiting three long years for his condition to stabilize, he underwent the procedure. Within days, he was able to hold his head straight. He had physical therapy to strengthen his muscles and had "a clear, huge improvement in quality of life." For further information about the Bouvier Initiative, please call 407-727-0462. For further information about spasmodic torticollis, please visit The Dystonia Foundation.